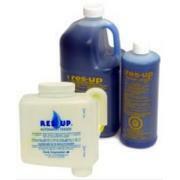 Res-Up and Res Care cleaner will chemically clean a fouled resin bed of a water softener and restore the exchange capacity of the resin. Most types of water softening resins can become fouled with iron and other contaminants that will affect the performance of the ion exchange system. Iron fouling can cause channeling, pressure drop, loss of capacity, hardness and iron leakage. Regular use of Res-Up will minimize fouling and extend the resin life in the water softener. Res-Up Feeders attach to your brine tank and automatically dispense the Res-Up cleaner into the brine solution where it cleans the resin during the regeneration cycle.